We had earlier discussed how to convert Word documents and email messages to a PDF file without buying expensive software or installing any virtual PDF printer driver. Now lets take a look at how to convert Microsoft Excel (.xls) files, OpenDocument Spreadsheet (.ods) files and even Comma Separated Value (.csv) files to PDF. All you need is an internet connection, the latest web browser and a Google account. Just upload your spreadsheet to Google Docs & Spreadsheets in one of several ways, open the file to edit and then export it as a PDF file. 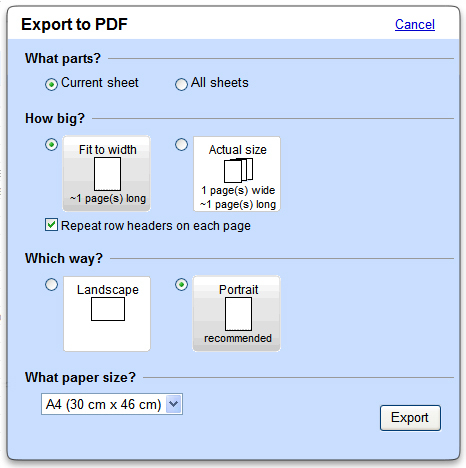 Follow the steps given below to convert your first spreadsheet into a PDF document using Google Docs & Spreadsheets. Step 1: Assuming you already have a Google Account, upload your spreadsheet to Google Docs & Spreadsheets here in one of several ways provided. Step 2: Open the uploaded spreadsheet for editing. Step 3: Click the Google Docs & Spreadsheets File menu and click Export then click .pdf... . An Export to PDF screen similar to the one below will appear. Step 4: Select the appropriate options and then click Export. A File download dialog box will appear. Step 5: Click Save and select the folder where you want to save the PDF file on the hard drive and give a name to your PDF file. You cannot currently use the "Email-In Your Documents and Files" feature to upload more than one spreadsheet at a time. This is all well and good, but I have never run into a situation (not one time) where I have wanted to turn a useful document or spreadsheet into a useless 'Picture' of a document. How can I convert pdf's to data I can manipulate without buying expensive software?